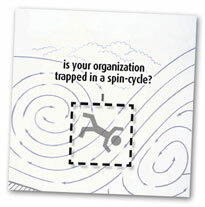 Are you and your organization learning as fast as the world is changing? Today, success depends on your ability to continually think, re-think, and re-invent. Challenging times require innovative thought and an intentional process. The Innovation Center provides resources to speed innovation along, make it more efficient, and weave it into the fabric of your organization’s everyday activities. Anyone can learn to innovate. 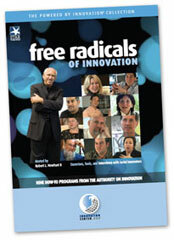 Free Radicals shows you how. Using this collection of nine video programs, you will learn how to use creativity and innovation to find solutions for challenges within organizations, families, and communities. Most people appreciate innovation’s benefits, but few actively pursue it because of a fear of failure. Why? Because people are afraid of change. However, danger and failure can act as a catalyst for innovation—spawning adventure, exploration, and fun! In fact, laughter is often the sound of innovation being born. In Free Radicals of Innovation, you will become more comfortable with risk and learn tools and techniques to create new solutions. We help you break through— with our interactive i2F strategy thinktank events. 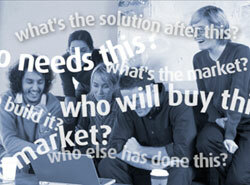 i2F is an immersive, interactive, no-holds-barred journey to surprising, new solutions. Our i2F team leads and coaches your group through a creative process that will revolutionize the way you attack problems and develop new solutions.